OMG... the weather is absolutely gorgeous... just purely gorgeous. I love fall/winter seasons and New York's temps today is in the 70s... just love it. Hoping this is the beginning of more cooler temps.. 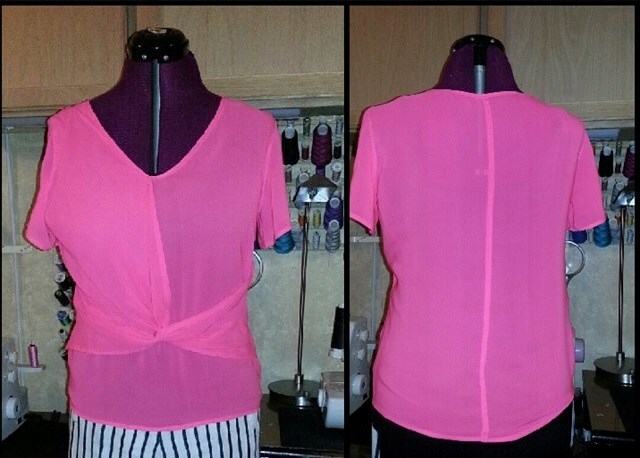 The OOTD is another Simplicity 1849 in a neon pink sheer polyester. The color was inspired by a young lady who wore a button up sheer blouse with burglar stripe pants. I was gobsmacked over how fabulous the garments looked together on her. Of course, I had to take a trip to 123 Fabrics and get a 1-1/2yds of neon pink. The pictures do not show how bright the top is, but trust & believe it is briiiiiight. Prior Review Here. You will notice that I am wearing it sleeveless, although I have made this blouse too many times, this particular remake was a challenge. Another issue, was fabric pooling in the back and ended up splicing along the center back and creating a center seam, thereby removing some of the ease. Easy enough tweak that worked perfectly. Although this project gave me a run for my money, the end result yield a cute top that works so darn well in giving new life to an old Loft suit that I refashioned to short sleeves. After a few hours of wearing heels, my feet dictated it was time to get grounded and put on my Byteme Peep Toe Flats. If you've been on the fence about wearing Neon Pink, Hot Pink or Bold Pink in general, this article is the perfect remedy for it.... "Hot Pink makes for the perfect attention grabbing color that can work with anyone's wardrobe." So don't be shy... go on and rock it. So very chic. Perfect summer top. And the peep toe shoes, perfect! Oh you have OWNED that pattern! Thank you Mrs. Smith. Its a great pattern and couldn't resist having a collection of them. Love the color. Looks great. Isn't it always the case when you change the fabrication your go to pattern had to be altered all over again. Tweaks but necessary. I don't have a problem with loud colors. So I thinks this is a gorgeous combination. Wow! You have gotten a lot of mileage out of that pattern. Each version is as beautiful as the next.